Van Buskirk: I read an article from late last year that included a quote from you about the notorious "Pitchfork effect," in which albums recommended by that site start flying off the shelves. Have you noticed a "MySpace effect," or is that something you'll be going after with Other Music's digital music store? Madell: Sure, it's undeniable that these days the influence of traditional print magazines has been overshadowed by websites and blogs; they're quick and convenient, and have their ears a bit closer to the ground than traditional media. As for MySpace and the like, I guess I feel like the biggest drawback of these types of social-networking sites is that there is just too much information. If you don't have the time or energy to listen to every band in existence, but you love interesting new music, a place like Other Music can be great, because our staff is paid to sort through all the crap. We can feature the best stuff out there, and hopefully present a convenient, well-maintained site where you can listen, learn and buy. You could argue that Madell underestimates the filtering capabilities of social networks with recommender systems built in, like Last.fm, but I think what's interesting about this quote is the blending of new technology platforms and informed human guidance. I'm two and a half weeks from the deadline for the final version of my book — so that's why things are a bit quiet here at the moment. 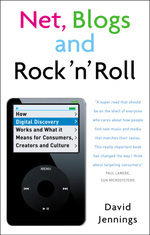 Nearly 60 percent of consumers report that they are listening to more music since they started using an online service. The 1,008 consumers surveyed enjoy Internet radio, subscription music services, and pay-per-download music services, including AOL Radio, Yahoo! Music, iTunes, Rhapsody, Zune, Urge, Napster, Pandora, Live365 and others. The vast majority of online music service users report that enjoying music over the Internet has expanded their musical tastes, allowing them to discover new artists and explore new music genres. About 25 percent reported having discovered a lot of new artists, while more than 60 percent of consumers surveyed say they have discovered some new artists. Nearly 7 in 10 online music consumers are enjoying new genres of music since listening to online music services. According to the survey, online music listening has increased music fans' overall music discussion with friends and co-workers, with more than 35 percent now talking about music more. And, more than 75 percent of online music consumers report they have recommended a particular service to a friend or co-worker. Phew, that's a relief. Frankly, if any of those trends were not happening, the case for me writing my book would be pretty slim. Discovered via Digital Media Wire. So the UK Singles Charts have changed their rules to include all downloads (irrespective of an accompanying physical release), and as a result, various hits from yesteryear are coming back from the dead. On one level this makes the charts, and the means by which they are calculated, more transparent and straightforward. Whether it will also increase the amount of 'dead weight' in the Top 40, and make it a less salient measure of what's hot, remains to be seen. Retailer HMV may believe (or hope) so, as it is pulling the chart from its racks after "deeming [it] no longer relevant to its in-store offer", according to Music Week (subscription required). Unit sales are by no means the only the way of keeping your finger on the pulse these days. The trackability of digital behaviour makes all sorts of measures possible. Take a look at Flickr's weekly 'chart' of interestingness, for example. And if you want a true measure of genuine popularity, wouldn't it be better to count what people actually listen to, as do the MyStrands and Last.fm charts? The main problem with that is that that it brings back even more old songs (Oasis's Wonderwall, released in 1995, still features in both the MyStrands and Last.fm Top 10s at the time of writing). Charts can't be static; they need a narrative to draw people in.